When you think about social media, sites such as Twitter and Instagram probably come to mind first. It’s easy to forget that YouTube, the popular video hosting platform, is also a powerful social media network. Even if you don’t specialize in video content, it can be well worth your while to create a company YouTube channel. YouTube has over one billion regular users, who collectively watch a billion hours of video each day. This gives the platform incredible reach, and just about guarantees that your target audience is already using the site. If you can grab their attention with your own channel and content, you’ll be able to communicate your message and – hopefully – increase conversions. In this guide, we’ll discuss why creating a company YouTube channel is a smart idea. Then we’ll walk you through the process, and offer some advice to help you get started. Let’s take a look! YouTube is a popular space for entertainment, news, educational content, and of course cat videos. Among all that noise, it’s easy to forget that YouTube can also be a powerful platform for businesses. After Facebook, YouTube is the second most popular social media platform, and we’ve already discussed how massive its audience is. Establishing a company presence on YouTube provides you with access to a ready viewership, and a lot of opportunities. You can publish informational content, tutorials, advertisements, and anything else that will help you drive conversions. 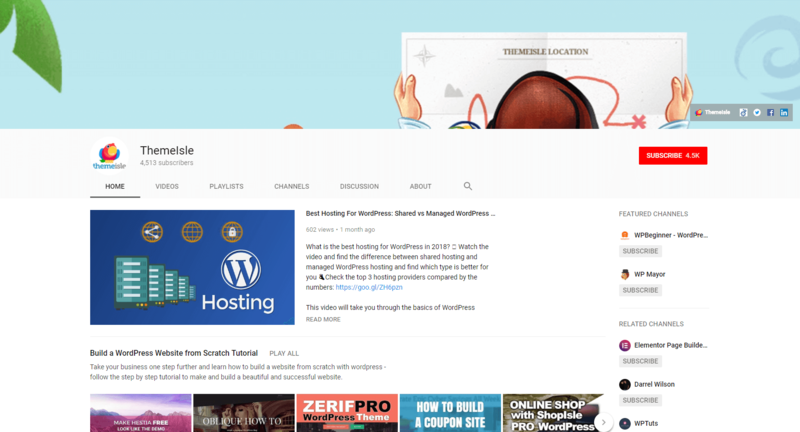 Our sister company, ThemeIsle, has done well with a YouTube channel (shown above) that features all of these types of content and more. In addition to its popularity, there are a lot of benefits to leveraging YouTube as a social media tool. For example, you can reach new audiences who don’t frequent the platforms you’re currently targeting. Plus, you can use your videos to direct leads back to your website (or wherever else you’d like them to go). Videos get more attention than other forms of marketing, they’re shared more often, and they tend to result in higher conversions and better sales. The benefits are so clear that few businesses can afford not to at least dabble in this type of content. What’s more, there’s no better place to do so than on the internet’s most popular video platform. YouTube caters to a wide range of demographics, covering all ages and myriad countries. Whoever your audience is, chances are they’re already using YouTube regularly. Best of all, only 9% of U.S. businesses currently have a presence on the platform. This means that competition is low, and you could see excellent results if you play your cards right. By this point, we’ve hopefully convinced you that creating a company YouTube channel is well worth your time. The only potential downside is that it can take more work to establish yourself on YouTube than on many other social media platforms. To speed up the process, we’ve put together this guide to walk you through each step of the way. Even if there aren’t many businesses on YouTube, there are a lot of channels overall. This means you’ll need to find a way to catch your audience’s attention. To do that, we recommend considering your channel’s focus carefully well before actually creating it. 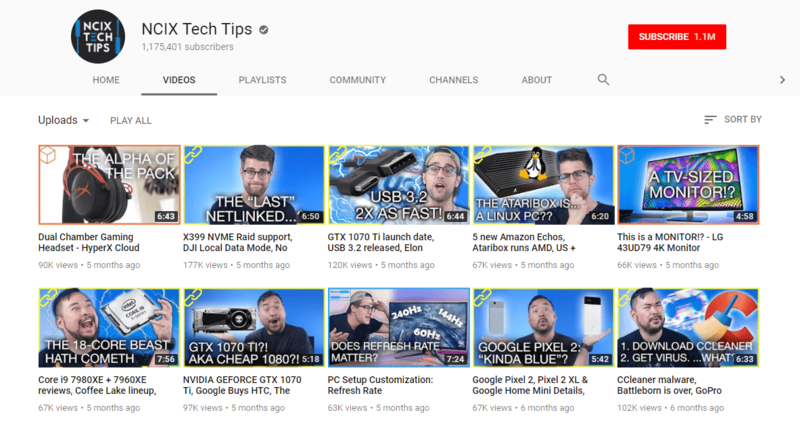 Computer company NCIX has done this quite well, building a popular YouTube channel focused on tutorials and product features (pictured above). Obviously, the broad focus of your channel is likely to be on your business. However, you’ll need a more specific angle if you want to stand out. If you can establish a theme and genre for the videos on your channel, you’ll be able to present a more coherent message. As you can see from the last two examples, your YouTube channel doesn’t have to be focused exclusively on advertising your business. People don’t generally visit a site like YouTube to watch ads, after all. You can get better results by creating informative or entertaining content, and working in a mention of your products or services where relevant (much as you would do when creating a company blog). Once you have a clear focus in mind, it’s time to actually create your channel. As with most popular social media networks, the process is pretty simple. The only thing you’ll need is a Google account. This will also be the name of your YouTube channel, so consider your options carefully. You can simply name the channel after your business, or pick something that reflects your focus or niche. Either way, it’s best to opt for something creative, but also short and easy to remember. Your channel is now up and running, but it’s pretty sparse at this point. That means it’s time to start customizing it. Here, you can get a snapshot of what your channel will look like to viewers. There are a number of important actions to take at this point. We’ll go through them one by one, although you can tackle them in any order you like. You can set privacy settings for your videos here, enable or disable comments, and access translation options. 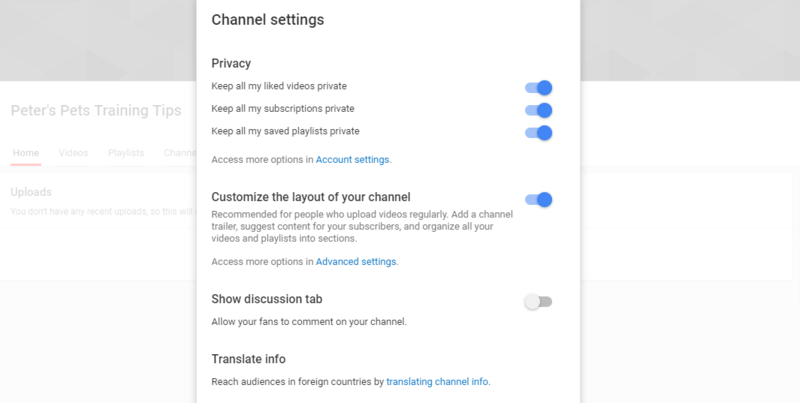 Most importantly, you’ll want to ensure that the option labeled Customize the layout of your channel is toggled on, since this enables a lot of additional features. The text you enter here will appear on the About tab for your channel, and will also show up when viewers mouse over your channel icon elsewhere on the site. You’ll want to keep your description brief and compelling, giving people an overview of what your channel is all about. You can include links as well, leading to your website and other social media profiles. By clicking on the user image in the top left corner, you can also change your channel’s icon (which is linked to your brand account). Even if you create new imagery to use for your company YouTube channel – which is a good idea – you’ll want to make sure that it’s consistent with your overall branding strategy. At this point, your channel should be looking pretty good. Now that you’ve dealt with the basic customization options, it’s time to actually start adding content. Before you start uploading regular videos for your channel, you’ll want to create a channel trailer. This is a special video placed front and center on your channel, which only appears to unsubscribed viewers. Think of your trailer as the advertisement for your channel – it’s your chance to hook visitors and interest them in checking out more content. When creating your channel trailer, it’s best to make it short and to the point. Keep your target audience in mind, and quickly explain how your content can solve their problems, teach them something useful, or perform some other valuable service. It’s also a smart idea to incorporate some humor and other attention-grabbing elements, and to directly ask viewers to subscribe to your channel. Click on the Channel trailer button, and pick the video you just uploaded. That video will now be the first thing new visitors see when they check out your channel’s home page. At last, it’s time to start creating videos and uploading them to your channel! Of course, you don’t want to add a bunch of videos all at once. Just as with a blog, it’s best to decide on a posting schedule for your company YouTube channel early on. The ideal schedule will depend largely on how much time you have to devote to your YouTube marketing. The more videos you upload, the more quickly you should be able to grow your subscriber base. However, even if you can’t add new videos often, you can still build a following. The key is consistency. So set a schedule – such as posting every Thursday at 2pm – and stick to it. Then, of course, you’ll need to start putting together your videos. How to actually create videos is beyond the scope of this article, which is why we’ve created a separate guide to making videos. For now, just remember that quality is important – especially when you’re hoping people will share your videos. It’s better to take your time putting together a well-scripted, professional-looking video than to rush out a lot of sub-par content. Finally, don’t forget that your videos don’t have to live only on YouTube. Sharing YouTube videos on other social media platforms is often quite simple, and you can embed them on your website easily. You can also include a link to your new company YouTube channel wherever you have a presence online. The most effective channel is one that’s part of a larger, well-implemented social media strategy. The key to marketing effectively online is branching out, and taking advantage of channels you might not usually consider. As popular as YouTube is, many businesses don’t consider using it to their advantage. However, you now know better than to make that mistake. Do you have any other questions about how to build an effective company YouTube channel? Ask away in the comments section below!